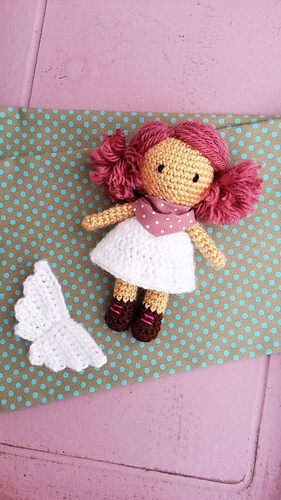 This pattern describes a cute and simple little angel, can be a toy, a gift or used as decoration. 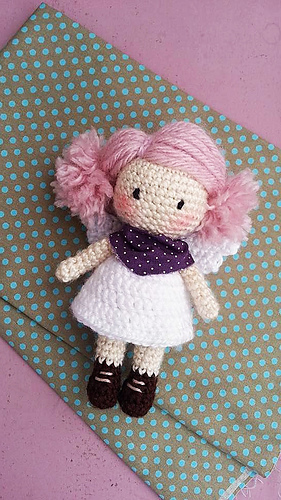 Gaby is really easy and fast to crochet following the written pattern and tutorial with many pictures, you just need to have basic crochet skills for making this angel. Eyes are anchored (photo tutorial), but 4-6 mm safety eyes can be used also. 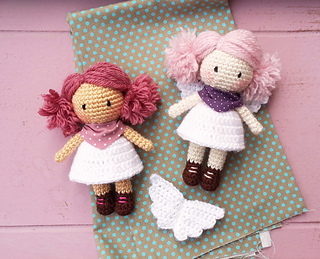 Sample angels are made of Bonbon Lüx yarn with 3,5mm hook. Bulky yarn needed just for the hair, but it can be replaced also. Pattern has instructions for case you are using other weight of yarn for hair or body even. You are allowed to sell the finished product but not the pattern, thank you for your understanding.